What’s the best way to promote how amazing your cakes are? Testimonials! Positive feedback from your previous customers. Collect comments from your customers on Facebook, emails, messages and in person. Always verify with them that you can use their comment and their name but usually if they are happy with your business, they will be happy to help you out. These testimonials are easy to add to your website and will definitely help potential customers choose you over other decorators that don’t have any proof that they are good at their job. 1. 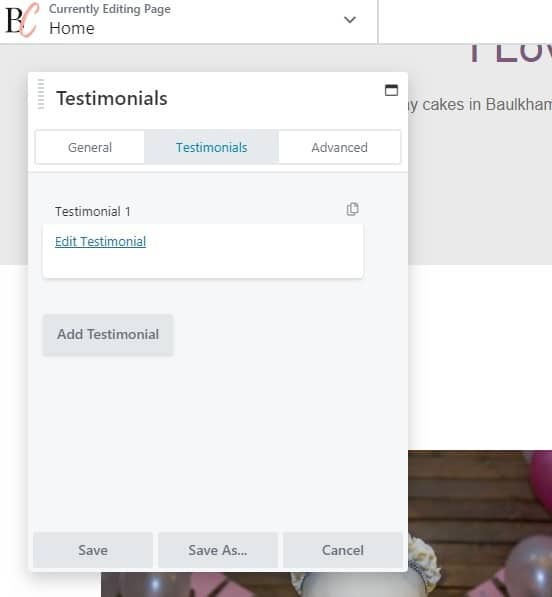 Go into your ‘Page Builder’, onto the page where you want to add the sliding testimonials section. 2. Go up to the top right corner and click the + button. 4. Click and drag that ‘Testimonials’ option over to the section where you want it to sit. If you want it to be prominent on your page, make sure it shows ‘New Row’ in the bright blue line. 5. 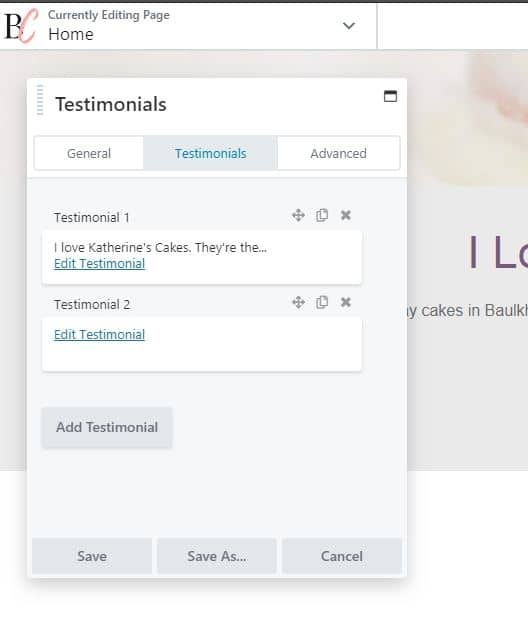 An options box will pop up for you to choose how your testimonials look. 6. The first tab will ask about sliding times, and layout. The second tab called ‘Testimonials’ is where you will enter the information about what your customers have said. Click on ‘Edit Testimonial’ to do that. 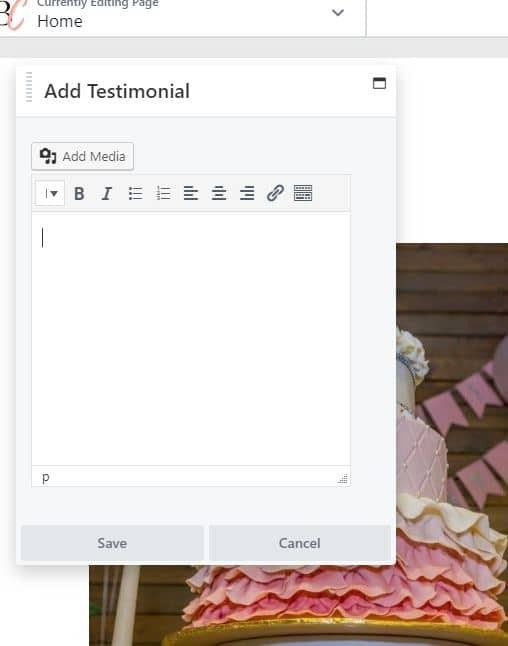 ‘Add Testimonial’ in the grey button will let you add another person / comment. 7. 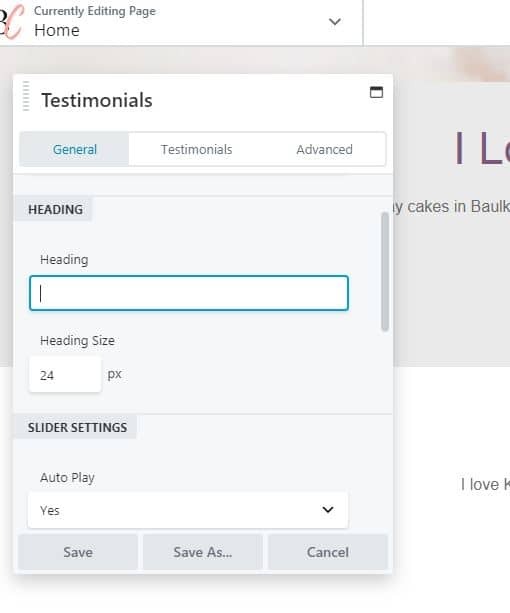 Type your testimonial in this box, using the formatting choices with fonts etc. As the default is left justified, you may want to ‘centre’ your text in this section, so the comments sit in the middle of the page. Just highlight the text and click on the button with all the 4 horizontal lines centred. 8. Also note that you can remove or change the default heading of ‘Testimonials’ (found on tab 1 – General). Leave it blank if you want to remove it. 10. 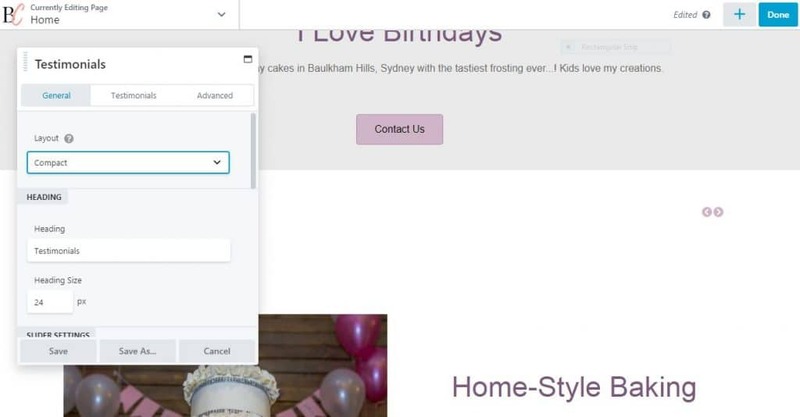 To add your own heading to match your page settings, simply go to the + button again, and drag and drop the ‘Heading’ option just above the Testimonials section. 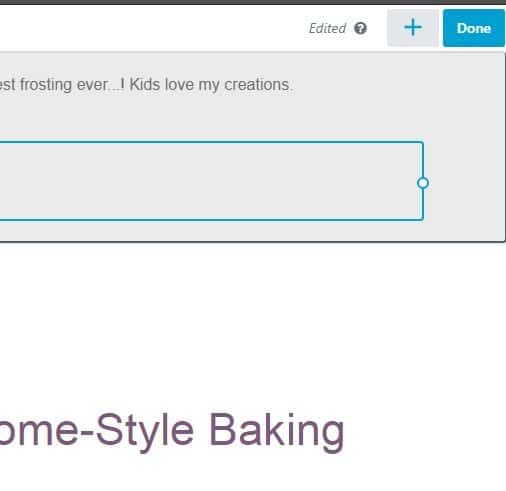 See the ‘Introduction to the Page Builder’ video for a quick rundown of this.